Along the northwest section of the park drive, yellow hills and green valleys provided a change in color contrast of the landscape. 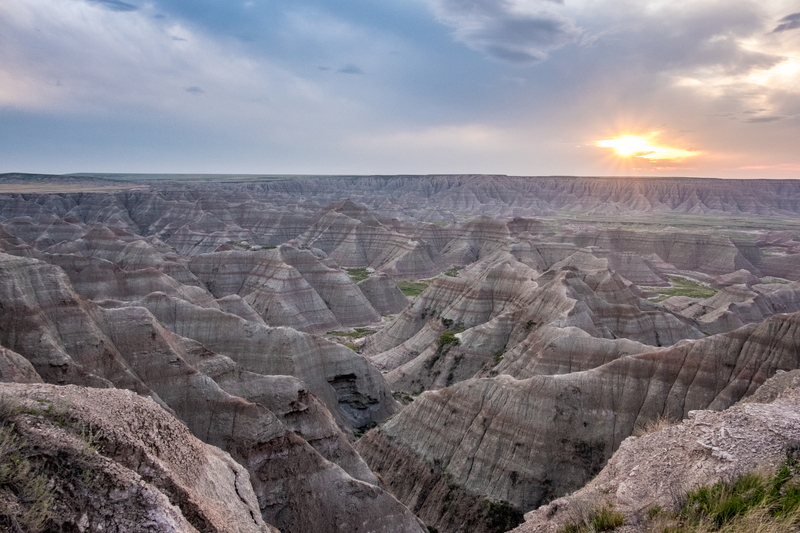 This post concludes my quick trip through the badlands. Some day I hope to go back and explore the area at a more leisurely pace. This entry was posted in Landscape Photography and tagged Badlands National Park, Fall Colors, hills, Landscape, National Parks, valleys, yellow on June 19, 2016 by kgrafphoto. Sharp eroded ridges dominated the skyline of the Badlands. They stood like guardians protecting the land below. 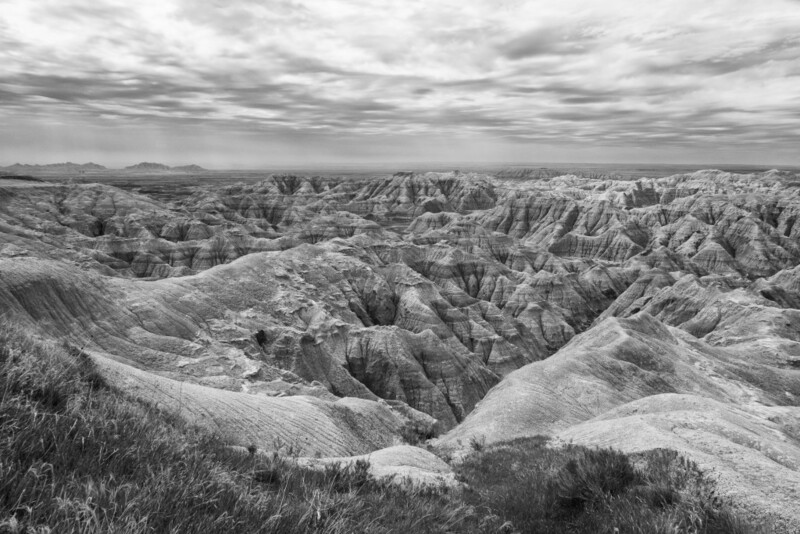 This entry was posted in B&W Photography, The Grand Landscape and tagged Badlands National Park, Landscape, Mount on June 18, 2016 by kgrafphoto. The sun broke through the clouds and focused its brilliance on this rock outcropping and the valley below. The large ridge behind me kept the foreground in shadows. This entry was posted in The Grand Landscape and tagged Badlands National Park, geology, hills, light on June 16, 2016 by kgrafphoto. At one time this area was a vast a sea bed. Color abounds in the different strata deposited over the millions of years in our geological history. I just felt in awe as I viewed the history in front of me. I felt so inconsequential in the stream of time. 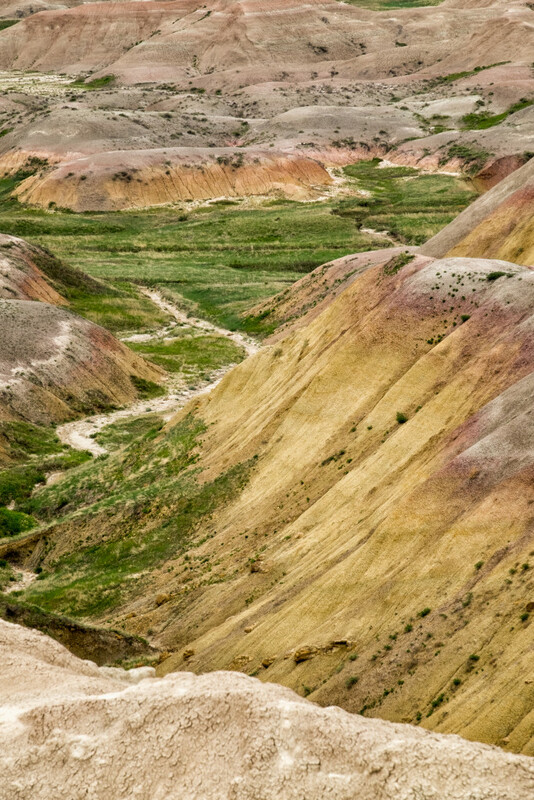 This entry was posted in The Grand Landscape and tagged Badlands National Park, geology, hills, lines on June 15, 2016 by kgrafphoto. The sky was very dark and covered with clouds. The landscape was very dark and covered with shadows. Then for a few seconds the sun popped out in a small gap in the clouds. The landscape opened up its arms for me to enjoy. The three hour drive starting at 3:00 AM to catch the sunrise was worth it! This entry was posted in The Grand Landscape and tagged Badlands National Park, Landscape, lines, Mountains, Red, Spring, sunrise on June 14, 2016 by kgrafphoto. 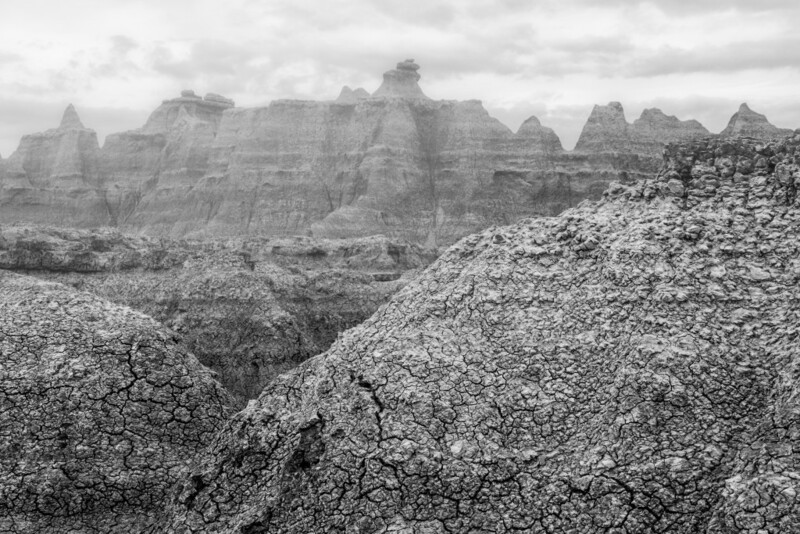 I walked down into the basin of the Badlands and looked up to see the towering, eroded hills behind me. I processed this image to separate the foreground from the background by adding a touch of NIK’s Color EFEX Pro graduated fog to the background. I should have shot this image at a wider aperture to produce a natural effect. Lesson Learned: Take my time, work the image from different settings and exposures to create the effects that bring out specific elements of the subject. This entry was posted in B&W Photography, The Grand Landscape and tagged Badlands National Park, Landscape, Mountains on June 4, 2016 by kgrafphoto. During a 2,880 mile, 4 day drive from Philadelphia to Washington State, I made one stop to photograph the Badlands National Park. 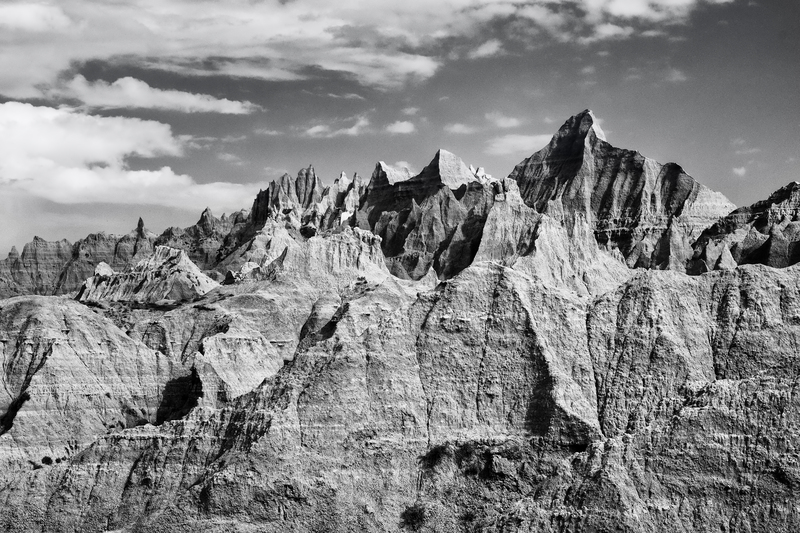 The Badlands has been on my photography “bucket list” for years. I got up early at 3:00 AM and drove 200 miles to catch the sunrise at the park. I spent only 5 hours driving and taking short walks to capture the typical sights. It was more of a quick scouting expedition rather than a planned photo shoot. I will be back! The light was rather poor, even at sunrise. But that did not alter my enjoyment of the park. I anticipated that I would end up processing the images in B&W, so I focused my shooting on trying to capture tonal contrasts. 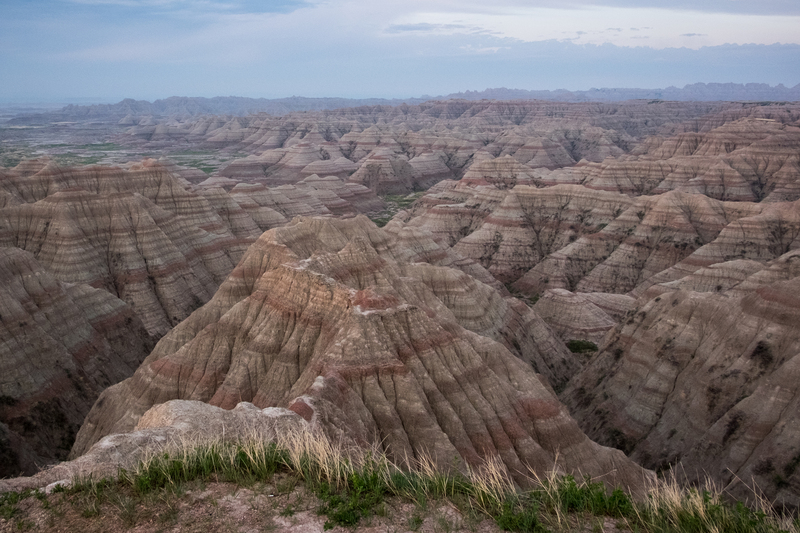 During the next few days I will post additional Badlands National Park photos. 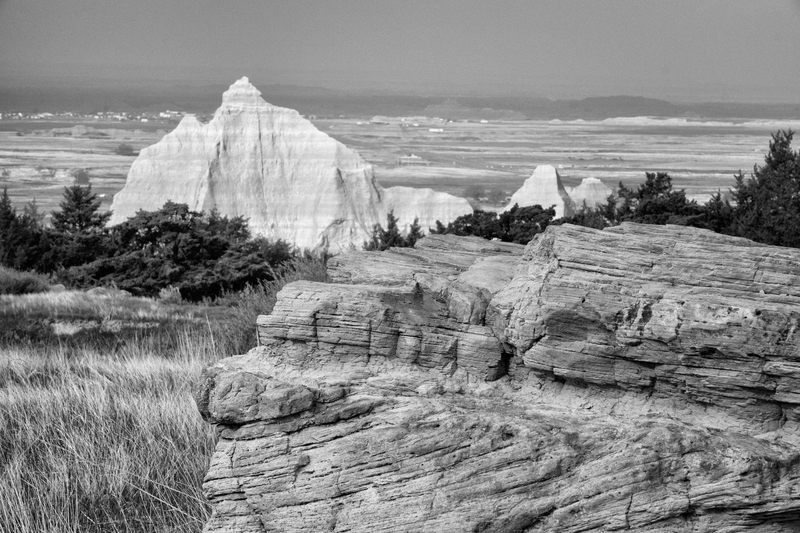 This entry was posted in B&W Photography, The Grand Landscape and tagged Badlands National Park, Landscape on June 3, 2016 by kgrafphoto.